"Thank you so much for the great work that you guys are doing.You got the fun job putting it all together and seeing your work become the best. I guess it is you guys and Google that controls the world to make things flow actually more important than any president eh! Bottom line is it must be fun with that type of talent…Thank you for everything." 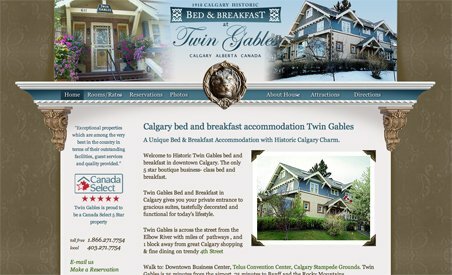 As a recognized historic site, Twin Gables is Calgary’s most significant bed and breakfast. Built in 1910 by a prominent Calgary lawyer, Twin Gables stands on Mount Royal, which was originally called American Hill. Now fully restored, the bed and breakfast retains the elegance of its rich history. Visitors will enjoy a taste of the past with Tiffany lamps, leaded stained glass windows, hardwood floors, pocket doors and antique furnishings. Twin Gables is located across from the Elbow River, just minutes from downtown Calgary.